The Functions of Arbitral Institutions offers a clear yet nuanced overview of the diverse and complex reality of institutional arbitration, while challenging the assumptions conventionally held as to the role of arbitral institutions. For many decades, users of institutional arbitration have resolved cross-border disputes successfully through institutional arbitration without fully understanding the precise nature of the functions exercised by arbitral institutions and their impact on proceedings. Even though practitioners and arbitrators have gathered significant expertise as to the manner in which arbitrations ought to be conducted, many misconceptions remain. What is, in essence, institutional arbitration? How does the internal organization of arbitral institutions affect how they discharge their duties? To what extent does the role of institutions vary from one set of rules to another? Do some institutions participate in the overall adjudication of the disputes they administer? How does due process apply to arbitral institutions? This is the first in-depth study on the role of arbitral institutions in the proceedings submitted to them, explaining systematically the interaction among arbitral tribunals, parties, and institutions. Drawing both on the author’s wide experience and on a carefully designed survey, the book provides a systematic study of the activities performed by more than forty leading international arbitration institutions worldwide, including the ICC, LCIA, ICDR, SCC, SIAC, HKIAC, JAMS, CIETAC, KLRCA, DIS, DIA, NAI, CEPANI. 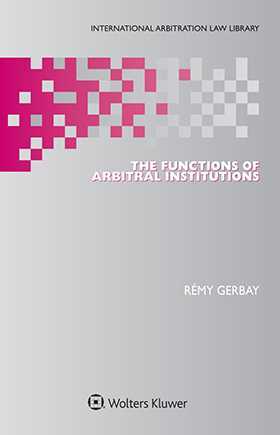 The book examines the arbitration rules of each tribunal together with internal documents where available and provides detailed analyses of a wealth of relevant court decisions from leading civil law and common law jurisdictions, with particular emphasis on France, England and Wales, the United States, and Switzerland. This book offers to readers, whether practitioner or academic, the ‘theoretical keys’ needed to understand the arbitral process and the role of one of its main players. The reader gets in a single volume a complete panorama of the diverse reality of institutional arbitration. It also offers a novel manner of understanding the role of such arbitral institutions (paradigm shift) and challenges the conventionally held beliefs and assumptions as to the role of institutions – no other book has examined the nature of the role in such detail. This book is thus invaluable to academics and practitioners interested in furthering their theoretical and practical understanding of institutional arbitration and arbitral institutions.